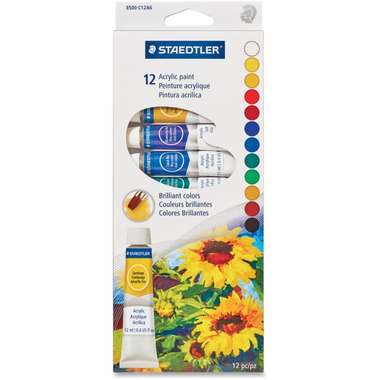 Staedtler Acrylic Paint Tube Set feature highly pigmented colours that are easy to blend and mix with smooth consistency. Versatile design can be used on a wide variety of surfaces. These high-quality colours lay down thick for texture and impressive brush marks. Paint can be thinned with water for subtle washes. After drying, this paint is waterproof and fade-resistant and will maintain its quality appearance. Washable formula cleans up easily with water.